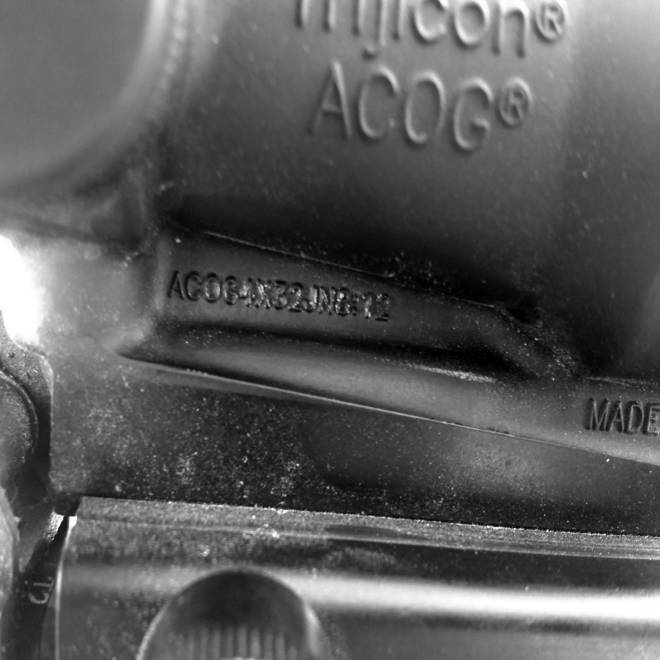 The code on an ACOG (Advanced Combat Optical Gunsight) made for the U.S. military by defense contractor Trijicon. The lettering at the end, JN8:12 refers to the Bible passage John 8:12. When the so-called "Jesus rifle" came to light in Jan. 2010, it sparked constitutional and security concerns, and a maelstrom of media coverage. The Pentagon ordered the removal of the secret code referring to Bible passages that the manufacturer had inscribed on the scopes of the standard issue rifles carried by U.S. soldiers into battle in Iraq and Afghanistan. Nearly three years later — despite the military's assertion that is making "good progress" — the code remains on many rifles deploying to Afghanistan, which some soldiers argue is endangering their lives by reinforcing suspicions that the United States is waging a crusade against Muslims. "I honestly believe that this is a dangerous situation. It literally could be a matter of life and death for a soldier if he fell into the wrong hands," said an Army officer who spoke to NBC News from Fort Hood, Texas. "The fact that combatant commanders are not following (rules set by Department of Defense) commanders is very disturbing to me." The officer, who asked not to be named out of fear of reprisal from commanders, provided a photograph, taken on Tuesday, of the code on an M-4 rifle assigned to a soldier who is slated to deploy to Afghanistan in coming weeks. The code stamped into the metal of the soldier’s ACOG (Advanced Combat Optical Gunsight) ends with the model number with "JN8:12." which refers to the New Testament passage, John 8:12, which reads: "Then spake Jesus again unto them, saying, I am the light of the world: he that followeth me shall not walk in darkness, but shall have the light of life." Other rifle scopes among some 250,000 provided by Michigan-based manufacturer Trijicon were imprinted with codes that point to passages in Matthew, Mark, Luke, Corinthians and Revelation, ABC News reported when it broke the news in 2010. Trijicon, reportedly had been following this practice for at least two decades, and it was well known to gun enthusiasts. But these scopes attach to M-4 assault rifles used by U.S. troops, allies and Afghan and Iraqi forces being trained by the U.S. military. The Military Religious Freedom Foundation, a nonprofit group that aggressively pursues the separation of church and state in defense institutions, first flagged the issue in late 2009 after receiving scores of complaints from active duty military members. "It’s constitutionally noxious," said foundation president Mikey Weinstein. "It's an embarrassment and makes us look exactly like the tenth incarnation of the crusades which launches 8 million new jihadist recruiting videos." The military first said it was unaware of the biblical code. Then Gen. David Petraeus, formerly the head of U.S. Central Command overseeing U.S. forces in Iraq and Afghanistan, in Jan. 2010 issued a press release saying he was "very concerned" to learn of the biblical markings, which were "contrary to U.S. Central Command guidance." "Our mission is to protect the population we're serving and establish conditions for security, stability, and development, and we strive to do that while remaining sensitive to the cultural and religious norms of the populace we are supporting," he said. In Jan 2010, Trijicon which had a multi-year Defense Department contract to provide up to 800,000 sights, announced it would stop printing the verses on new scopes for the military use and provide modification kits for the removal of the code on existing scopes. The Department of Defense said it would modify the scopes, starting with those on bases, though in March said it might take as long as a year. Not all observers thought removal of the unobtrusive lettering on the scopes was a matter of great urgency. "I understand that we have already started to address this issue," said retired Lt. Col. Robert Maginnis, in a debate with Weinstein on ABC News in March 2010. "You may argue it’s not fast enough," but he said he saw "no evidence" that the code presented a security issue. Fast forward two and a half years, and "Jesus rifles" are still widely used in the United States and in areas of conflict, according to the Fort Hood officer, who was deployed to Iraq in 2010-2011. He says he has never seen a fixit kit. Weinstein of MRFF said he has received more than 2,800 complaints from troops about the Jesus rifles — now even more widely known to Afghans and Iraqis, in part because of the controversy. Iraqis "absolutely" know that it’s a Jesus rifle, said the Fort Hood officer, based on his experience. "Do all the Afghans and Taliban know about this? Probably not. But the ones who do could ultimately affect the life of a soldier," said the officer. "There’s absolutely no reason this couldn’t have been done in the first six weeks. And that just leads me to wonder why is the Army leadership not taking ownership of the responsibility of completing this task?" Contacted by NBC News, scope-maker Trijicon directed calls to the head of sales and marketing Tom Munson, who relayed the message through his secretary that "he had no interest" in discussing the Jesus rifle. NBC News queries to the military about the plan to remove the gospel-referencing code were answered in the form of an email statement saying the "corrective measures the Army took to remove the code were still ongoing." "We had to take steps to ensure the corrective measures did not impede ongoing operations in theater, but we've got procedures to catch this at multiple points," said the statement provided by Matthew Bourke, in the U.S. Army Media Relations Division. "We're making good progress."